Last week Hewlett-Packard hosted an amazing event: a Hacking Autism app hackathon, which showcased innovative and philanthropic synergy at its most brilliant. The all-volunteer event brought together notable autism experts and app developers to focus on a common goal: developing free apps for tablet environments, based on crowd-sourced ideas from the autism community, to help people with autism communicate and contribute. TPGA editor Shannon Des Roches Rosa was invited to participate as a parent and blogger resource based on her autism-specific iPad advocacy work, and found the event so incredibly positive that she is covering it in two separate posts. Part one covered the opening talks by the hackathon's advisors, and their specific takes regarding autism and technology. Part two is about experiencing the event itself. Innovative technology can make a difference for autistic people. My son Leo excels in ways we (and Apple) never anticipated via iPad/tablet apps, which is why I attended Hacking Autism's October 11 App Hackathon in Cupertino. I figured that if Leo has benefitted so extensively and so well from technology that wasn't necessarily developed with him in mind, imagine the possibilities when teams of the best and brightest software innovators actually considered the needs of my son and his peers! I was not disappointed -- those innovators, they produced some remarkable apps in a mere few hours. Getting to observe positive, productive tech/autism synergy up close was a faith restorative. Though Hacking Autism's stated goal is "using technology to give people with autism a voice," the App Hackathon was really about creating apps as useful tools for people with autism. The eight teams of volunteer developers spent the day creating apps chosen from the Hacking Autism idea gallery, including apps for social stories, learning to cross a street safely, and emotional "thermometers." 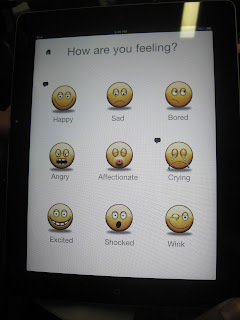 One amazing volunteer, Mayank Malik, was somehow able to solo-develop an Emotions app in parallel to his team efforts! Being at the Hackathon was electrifying -- all that volunteer talent, all that good will, working to help people with autism like (and unlike) my son -- and donating the resulting apps! It was occasionally emotionally overwhelming, but I was in good company, as opening speaker and HP CTO Phil McKinney teared up, too. I can't wait to see the apps that result, see if we can enter an era of apps that don't just avoid any special needs penalty costs, but integrate expert content and ideas with great design. It felt good to be able to contribute myself on a smaller scale, e.g., by showing one of the Social Stories app development teams how existing social stories apps look and function -- they'd never actually seen such an app before -- and advising them on which elements to mimic, and which to avoid. There was also a significant amount of parallel social activity, as developers and autism community members and experts got to mingle and brainstorm in person. I enjoyed finally meeting Russ Ewell, getting to see the Quick Talk Android AAC app he's developing (and would very much like SLP feedback on, hint). It was also a treat to meet Pamela Sloane-Bradbury from ExtraSpecialKids.com, the force behind my kids' much-beloved app Zanny: Born to Run. A significant personal highlight was an extremely frank but civil impromptu big autism issues discussion that literally took place around a coffee table -- between me, Steve Silberman, Autism Speaks reps Mark Sirkin and Peter Bell, and newly-diagnosed autistic John Scott Holman. When else would a group like this come together? I truly appreciated that meeting of minds. And I am especially grateful for all the interstitial hang-out time with two gentlemen who are consistently easy on the social anxiety: Steve Silberman, who is writing a highly-anticipated book on autism and neurodiversity, and Alex Plank, who was filming the Hackathon for Autism Talk TV. I'm delighted that more Hackathons will be happening, not just all over the U.S. but all over the world. I hope that eventually they might grow in scope, as part of my non-social non-advising non-sniffling Hackathon time was spent listening to my son Leo's autistic age-peer Schuyler St. Leger describe how he made the whistle he'd brought with him on his 3D printer, and hearing autistic adults talk about how much they adored and relied on Palm Pilot PDAs during the '90s and early aughts. I'm thankful for all the innovators who contributed to the Hackthon, I applaud their efforts, I will crow about the apps they produce -- and I hope this effort eventually extends beyond apps. The apps developed at the App Hackathon will be posted at HackingAutism.org as they are finalized over the next few weeks. Those interested in hosting or getting involved with a hackathon should contact Random Hacks of Kindness, RHoK.org, or check out the RHoK event planning toolkit.